The supper meals are prepared and packaged in the district central kitchen. East Chicago Schools has expanded an already robust afterschool meal program to four area community centers where kids congregate in the late afternoon. City of East Chicago Schools in Indiana is taking its supper show on the road. The high-poverty district already implemented a supper program at all seven of its school sites almost two years ago, but last fall the program was extended to four community centers in the district as a way to reach kids who leave right after school and don’t have a chance to get the afterschool meal. The community centers meet the guidelines that allow them to serve the federally funded suppers by offering a variety of enrichment programs such as tutoring and activities. 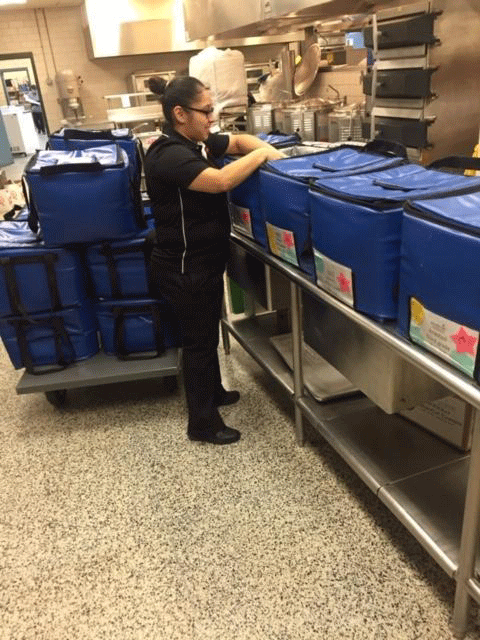 The meals are prepared and packaged in the district central kitchen, then delivered to the sites by the program’s own vehicle, which also delivers suppers to district school sites toward the end of each school day. “It works out really well,” Watson says, adding that the four community center sites collectively serve an average of 150 meals a day, almost all of it to kids who would not otherwise have gotten a supper at one of the school sites. Hence, the counts contribute a real increase to supper service in the district rather than simply changing where they are served. The meals can be either hot or cold. They are packed and transported in special insulated bags to maintain temperature integrity. “They are then taken out of the bags at the site and we distribute them to the kids,” Watson explains. There is no re-therming or temp-controlled holding capability at the service points. During the winter months, generally each week’s cycle menu will have three hot and two cold meals. Typical menu items include pizza (a popular choice usually served on Fridays), nachos, sandwiches, wraps and Lunchables-style packaged meal kits. As for expansion of the program, “we’re hoping to reach out to the Boys and Girls Clubs here in East Chicago,” Watson offers, but notes that the program is also piloting a supper in the classroom approach at one elementary site—district suppers at the schools currently are all otherwise served in the cafeterias—that uses the last 15 minutes of the school day to serve the food in similar fashion to how breakfast in the classroom programs work. The food is the same as what would be served in the cafeteria but the advantage of serving it in the classroom before the school day ends is that it can capture just about 100 percent participation. That school already also does breakfast in the classroom, so the idea of getting and eating a meal in the academic setting was not a big change for either the students, the teachers or the foodservice staff, Watson adds.